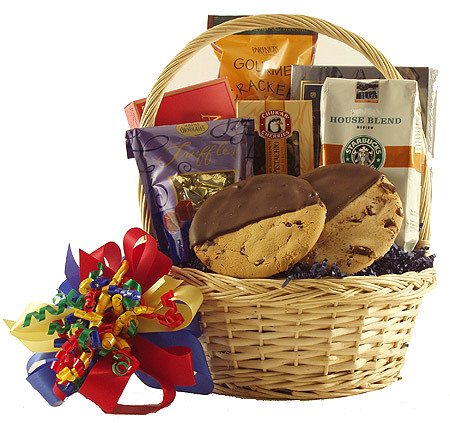 A delicious combination of treats awaits them in this Gourmet Gift Basket filled with Portlock's Smoked Salmon, Partner's Crackers, Chukar Chocolate Covered Cherries, Brown & Haley's Almond Roca, Dilettante Chocolate Truffles, a 12 oz. Bag of ground Starbucks Coffee, and two huge fresh baked gourmet Chocolate Chunk dipped in Chocolate Cookie. Sure to be a hit!